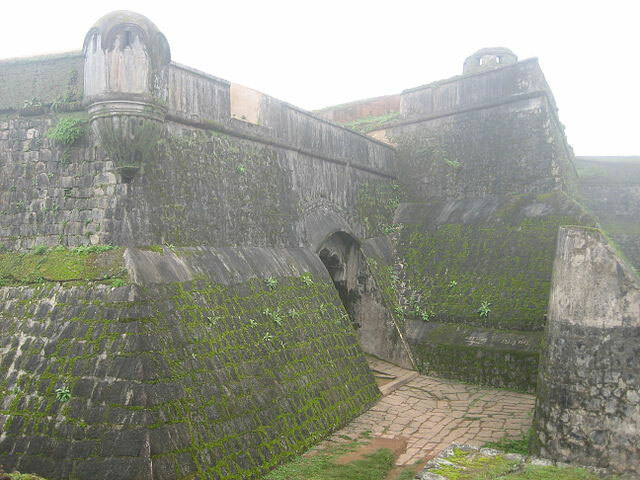 One of the first thing that strikes about Manjarabad fort is that it is star-shaped. The then ruler of the region, Tipu Sultan constructed this fort in the 18th century for strategic defence purpose as it was built on a hill top, at 3240 ft. above sea level. Another unique feature of the fort is that there is just one storey to it. The fort was built in the Islamic style of architecture. The entrance to fort has beautiful gateways shaped in the form of arches. It is believed that it took 7 years to construct the fort. You can see pits in the shape of cross which serve as the source of water. Vehicles cannot be taken till the fort and visitors need to get down some 200 m away from the fort and walk. There are around 253 steps to ascend to reach the gate. The Manjarabad Fort has been taken over by the Archaeology department and thus it is not open the entire time, but only from 8 am to 6 pm. The fact that Bisle View Point is a part of the Western Ghats makes it a beautiful spot. With spectacular scenic spots that are quite adventurous to trek on, Bisle Ghat is well-known as the trekkers’ paradise. Bisle Reserve Forest is also situated here which is home to a variety of flora and fauna. Many animals such as tigers, deer, leopard, Malabar Giant squirrel, and many types of reptiles and different bird species can be spotted in the region. It is popular as a view point to get the beautiful and astonishing views of three mountain ranges including Kumara Parvatha, Pushpagiri and Dodda Betta. A unique fact about the Bisle forest is that it includes a major portion of the Shola forest of the state and thus, it also has the largest number of wildlife in the entire Western Ghats region. The forest remains protected and unexploited as there is no human occupancy in it. Though any time of the year is suitable to visit Bisle View Point, it is during September to December that the place is full of visitors, may be because the climate is cooler during this period. It is a beautiful waterfall in the state and is just 1 km from Manhehalli village. The water falls from a height of 20 feet and is a popular picnic spot. You can have a view of the Pushpagiri mountains from here as the Manjehalli Waterfalls is just at the foothills of the mountain. You can get two views from here, one from the top and other from the bottom. Though you can get drenched under the waterfall and have fun, you have to be careful as the stones can be slippery. But there are security guards around. Manjehalli waterfalls are alive only during monsoon and during summer and winter months, there is scarcely any water. Also, after 5.30 pm, the entry to the waterfalls is closed. Spread around 100 acres, Raxidi Estate is one of the most prominent coffee plantations is Sakleshpur. There are also many pepper and cardamom plantations because of which there is lush vegetation that fills the Raxidi Estate. The spice plantations, the beautiful climate and the greenery around make Raxidi Estate a must place to visit. It is calm, serene and beautiful at the same time, which not only makes the estate pleasing to the eyes but also to your soul. You can also find many exotic trees within the plantations. The climate and adequate rainfall makes it a suitable environment for flora and fauna to flourish. Take a walk around the estate, inhaling the refreshing aroma of spices and coffee and feel the wind touching your face gently and get an experience that is worth cherishing all your life. Ancient temples are worth a visit because of several reasons, the architecture, the mesmerising story behind and to be at a place that is a symbol of history and devotion at the same time. That is why you should visit the Sakleshwar temple, one of the oldest temples in Karnataka, having been built in 14th century during the rule of the Hoysala dynasty. Dedicated to Lord Shiva, the Sakleshwar Temple has a beautiful architecture, in the lines of the renowned Hoysala architectural style. It is a prominent pilgrimage centre as well as a tourist destination. Yes. Its really a nice place. Could you please provide the route details for all these places, that could help in planning and visiting. Sakleshpur is one of the most beautiful places of Karnataka and thus one of the most popular destinations in the state. Could you please help me with ” Manjehalli Waterfalls” or “Manhehalli village.” . I am not able to locate any of them on Google maps.